A huge thank you to all my friends, family, and clients who shared in the 5 year anniversary celebration of my company this year! I wouldn't be where I am today in business or in life without the amazing support network for which I am deeply grateful. It is a gift to do meaningful work that makes a positive difference in our world. I am looking forward to more of those rewards in the new year! So, you have your Concealed Handgun License...now what? Our Safe & Sound Concealed Carry class will prepare you to make take safe action and use sound decision making skills regarding concealed carry. We provide you a framework to evaluate over a dozen different methods of concealed carry based on safety, security, accessibility and concealability. We provide you with practical, real-world training applications of concealed carry, including situational awareness and applicable Oregon state laws regarding the use of a firearm for concealed carry and personal defense. By course completion, you will have found several methods of concealed carry that will be effective based on your personal lifestyle, your wardrobe, and your physical abilities. Our Safe & Sound Concealed Carry class will prepare you make safe and sound decisions with your concealed firearm as a trained, educated, and responsible citizen. Course dates for Safe & Sound Concealed Carry are available on our Course Schedule & Registration page, and are denoted as "Women Only" or "Co-Ed." Additional dates for you and your private group or couple are available by email request. The B.A.B.S Training Team is proud to have a new training studio in historic downtown Oregon City, Oregon! Our new studio will be our primary classroom training location beginning in January, 2017. 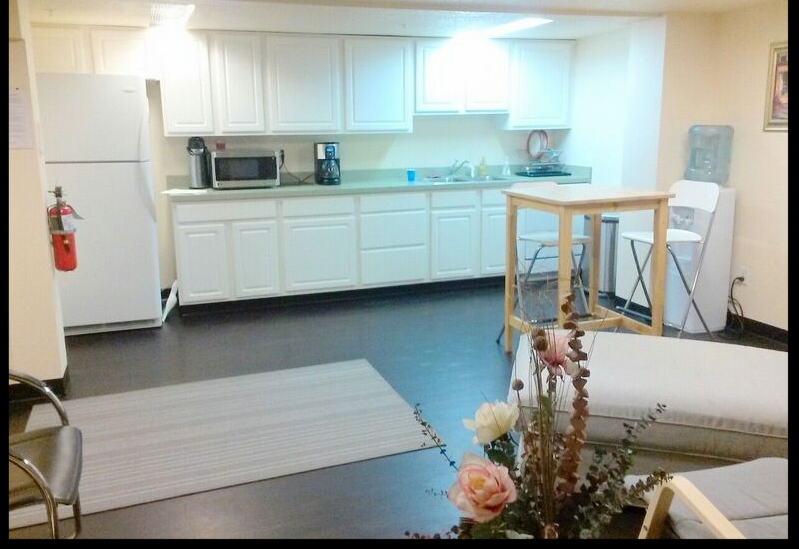 Our studio features a private training room, large conference room, and kitchen with refrigerator, microwave and eating area for clients who would like to bring their own lunch. Surrounding our new training space are dozens of restaurants, cafes, and coffee shops within easy walking distance, making for a great lunch break during our classes. Metered street parking is free on weekends, and very low cost on weekdays. With our new private training space, we can now offer personal training sessions and classes any day or time of the week at your request. Visit the B.A.B.S booth at the Portland Gun & Knife Show! The B.A.B.S Firearms Training team will be at The Portland Gun & Knife Show held on December 17th through 18th, 2016 at the Portland Expo Center. North Fork / Wolf Creek Reduced Impact Shooting Lanes Now Open to the Public! We are thrilled to announce the completion of the North Fork / Wolf Creek Reduced Impact Shooting Lanes, now open to the public! I was honored to have been asked a few months ago by the Oregon Department of Forestry to work as a consultant on their new project to reduce forest damage, wildfires, lead contamination, garbage dumping and unsafe conditions caused by unauthorized recreational shooting in our majestic forests. I toured some of the 500+ unauthorized shooting sites found in the Tillamook Forest, and was appalled at the prevalence and complexity of this problem behavior, including live trees literally shot to the ground, and shooters firing without a backstop, sending bullets right over hiking, ATV and equestrian trails. I was excited to have been asked to contribute my ideas on intuitive firing range design that incorporate the cardinal rules of firearms safety, and will make our forests safer for people enjoying all forms of outdoor recreation responsibly. The lanes are located at mile post 35 off Hwy. 26, and there is a sign reading, "North Fork / Wolf Creek." After turning off Hwy. 26, take the second spur road to the right and up a hill, and you'll see the first of the four shooting bays on your left. Each bay is designed slightly differently, and there is a turn-around at the end of the lane. Please help us spread the word about this great project, so we can potentially expand it across our state and national forests! The B.A.B.S Firearms Training team will be at The Portland Gun & Knife Show held on Friday, December 18th through Sunday, December 20th, 2015 at the Portland Expo Center. Join us at the Portland Women's Expo! The 2015 Portland Women’s Expo is scheduled for March 21, 2015 at the Oregon Convention Center. This event is a major fundraiser for the Portland Women’s Expo Foundation. One day, and over 400 exhibitors, all for your enjoyment! This year’s Expo will be March 21st, 2015 from 10 am to 6 pm at the Oregon Convention Center. From world class food, wine, to amazing live music. . .Exhibitor categories include health, beauty, spiritual healing, full body rejuvenation, nutrition, fitness, financial planning, home décor, and more. The B.A.B.S Training Team will be on hand all day to answer your firearms training questions, provide hands on demonstrations and assist you with registering for your next training session! Meet the B.A.B.S Training Team at the PDX Gun Show! Gift Certificates and 2015 Course Schedule available at the gun show! Our Fall Course Schedule is available now, including new 101 classes and trap shooting clinics! Have a blast breaking clays at our Women's Trap Shooting Clinics! New Women's Basic Firearms Safety & Awareness 101 Class Date Added! We'll be swinging by Curt's Discount Shooter's Supply after our Women's Rifle Fundamentals class this Saturday, June 28th to check out the workshops, demos and discounts at their Open House Event! Our Women's Rifle Fundamentals (202) course is now available! Meet the B.A.B.S Team at Sportsman's Warehouse Ladies Night! The B.A.B.S Training Team Has a Brand New Glock 42! 3-Gun Fun with Julie G!